In my seasonal reading, Stephen Moss, in Wild Hares and Hummingbirds, describes July as a month of stasis, “a chance to reflect on the rollercoaster ride of spring.” Now chicks have been raised, parent birds are moulting ready for the colder weather to come. Insects take centre stage. He describes grasshoppers, bees, butterflies, moths, including the very special Hummingbird Hawkmoth. He discovers all sorts of beetles and snails on a pond-dipping expedition with his children. The month starts with the white froth of elderflower and hogweed but gives way to the lilac hues of purple loosestrife and the various forms of willowherb. The festivity that stands out in July in Steve Roud’s book, An English Year, is the Well-dressing traditions of Derbyshire. Roud describes the decorations here: “One or more boards with a raised edge are prepared, depending on the size of the project. Hundreds of nails are driven into the board, to help keep the other materials in place, and it is then covered with a smooth layer of well-puddled clay, half an inch to an inch thick. The basic design has already been marked out on large sheets of paper, which are laid across the boards, and the lines of the picture are pricked out through the paper on to the clay. The outlines of the design are then filled out using hard objects such as small cones, berries, seeds, or pieces of wood. The full picture is then coloured in, painstakingly, using moss, leaves and individual flower petals, all pressed into the clay by hand.” Despite claims of a history that dates back to pagan times, Roud says the tradition cannot be found to have existed before the eighteenth century, and only then in reference to the village of Tissington. I think it sounds lovely, although can’t you just imagine a Midsomer Murder-type intrigue happening between rival well-dressers?! 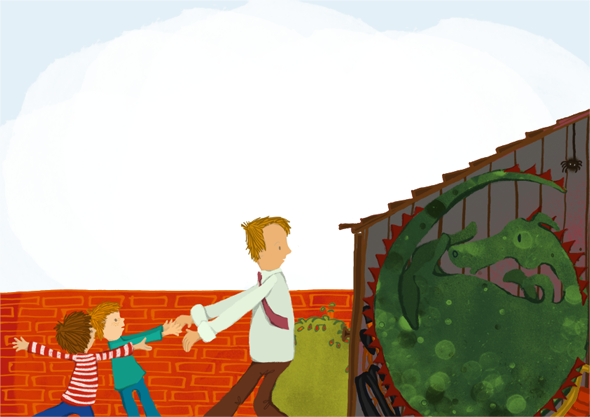 By the way, there’s a dragon hidden in the shed and Dad must never find out! This entry was posted in Countryside, Illustration, Wildlife and tagged an english year, bees, beetles, birds, butterflies, Derbyshire, dragon, Early reader, Hannah Foley, hummingbird hawkmoth, illustration, july, moths, moult, purple loosestrife, reading, seasonal, snails, Stephen Moss, steve roud, Tissington, well-dressing, Wild Hares and Hummingbirds, willow herb. Bookmark the permalink.